The Chinese Silver Panda is a series of silver bullion coins produced by the People’s Republic of China. The charming panda design of these coins have made them popular among both collectors and investors, many of whom purchase each year’s new design as it is released. Read on for information about the coin’s history, mintage, design, value, and more. The Chinese Silver Panda is legal tender within China, and is produced by the People’s Republic of China and distributed by branches of the People’s Bank of China. Their purity, weight, and content is guaranteed by the Chinese government. Minted since 1983 the design of the coin has varied each year. The obverse depicts the Temple of Heaven, with Chinese characters on top saying People’s Republic of China. At the bottom of the temple is the year of issue. The reverse features a portrait of a panda which generally changes each year. The composition of each coin is generally at least 0.900 fine silver, though this has also varied throughout the history of this coin. The first Silver Panda coins (dated 1983-1985) were proof quality, containing 27 grams of 0.900 fine silver in a 38.6mm diameter coin. Each year, just 10,000 such coins were produced, making these among the most desirable Chinese silver panda coins despite their relatively low silver purity. No silver pandas were minted in 1986. During 1987, the silver panda was a proof quality, 40mm diameter coin containing 1 troy ounce of sterling (0.925 fine) silver. 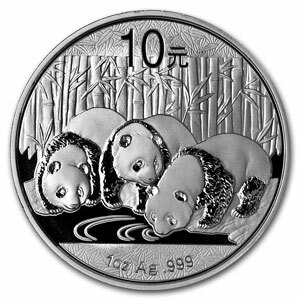 Since 1999, silver pandas have been produced with 1 troy ounce of .999 fine silver and measure 40mm in diameter. They have a face value of 10 Yuan. From 1989 to 2010, production ranged from 50,000 to 1,500,000 per year. In 2011, the scheduled mintage was 3 million, but 6 million were actually produced. The Chinese government is expected to dramatically increase the number of Chinese Silver Panda coins minted in upcoming years to account for increasing demand within Chinese, where last year it became legal for Chinese citizens to own silver coins. Already, some coin dealers are speculating that the Chinese Mint may be pushing for the Silver Panda to become as popular as American Silver Eagle bullion coins. Chinese Silver Panda coins are currently available in a range of sizes and denominations. Although the 1 troy ounce Silver Panda is the most common, there are also versions ranging from 0.5 troy ounce to 1 kilogram, and from 5 Yuan to 300 Yuan. In 2012, mintage is planned to include 20,000 1kg (300 Yuan) coins, 50,000 5 oz (50 Yuan) coins, and an estimated 8,000,000 1oz (10 Yuan) coins. In addition, many variations of this coin have been issued, including uncirculated, gold plated, colored, and commemorative issue. There is also a series of Gold Panda coins featuring the same designs used for the Silver Panda coin. The silver panda coins have been produced in Shenzhen, Shanghai, Shenyang, and elsewhere in China, though they do not carry mint marks, unlike coins made by U.S. mints. In certain years, there are minor variations such as the size of the date that enable to collectors to distinguish between coins made by different mints.